A group of people in Europe during the Middle Ages in which people worked and fought for nobles who gave them things in return. It was some sort of cooperative agreement. The nobles got the land from the Kings who made all the decisions. Feudalism in some ways is similar to tyranny because of the king's power. Although Feudalism was a type of government where the King made the decisions it worked for everyone because they had to compromise. For example, the Kings would give the nobles land in exchange they would provide the king with Knights to fight and protect is lands. Another example of how it worked was that nobles hired peasants to work the land and in return they earned money and had a place to live on the manor. The king rules the kingdom and makes all the decisions. They also give the land to the nobles. They had almost total authority except if the king said otherwise. They also got land from the king then in exchange they had to serve on Royal Council, they also had to pay rent and provide the king with knights. They also had to provide room and board for the King and his Knights when they traveled. The left over land they would give to peasants and knights. 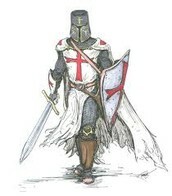 Knights were given their land by Noble’s, but in order to get their land they would have to serve Military service when ever needed by the King. Also they had to protect the Noble’s and their family’s. The Knights were able to have as much land as wanted, and were pretty wealthy although not as wealthy as an Noble. The left over land from the Knights were used by peasants and serves. To be able to become a Knight, you would have to be an family member of an Noble. You would have to have 13 years of training. The training to become an Night would start at the age of 7 or 8, first you would be an Page than a Squire and finally a Knight. There training techniques would include fight training and learning the Chivalry Code. 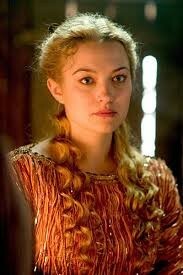 A Peasant’s social status was very low. They were treated poorly by the Nobles and Kings. Peasants had no rights and were owned by the Lord. In order to have the left over land from the Knights they would have to give labor in return. A Serf had no rights at all. They were the Lords Slaves. 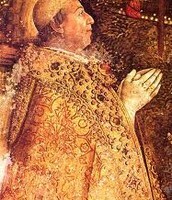 The Popes were the leaders of all Christians. 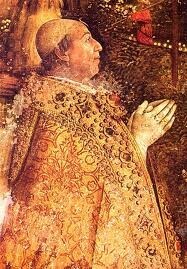 the Popes were in charge of the churches an all Religion properties. The popes also had the Church collect taxes from everyone. the Popes were into directing the Crusades for peaceful Christian pilgrimages to the Holy Land. A guild could learn a skill and earn a living such as Baking, Stone carving, Glazing, Carpentry, Processing Wool, Sewing, and Brewing ale. To become a guild worker you must first be an apprentice with someone in the field. Guild workers also form groups like unions which made laws and provide charity to those in need. Women did not have many rights. They were expected to stay home and take care of family needs. they did not involve themselves in politics. Many women were not able to get an education. The few that did get an education was through the nuns at the church. 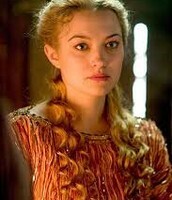 However, some women broke their roles and did great things such as Joan of Arc or Eleanor of Aquitaine. 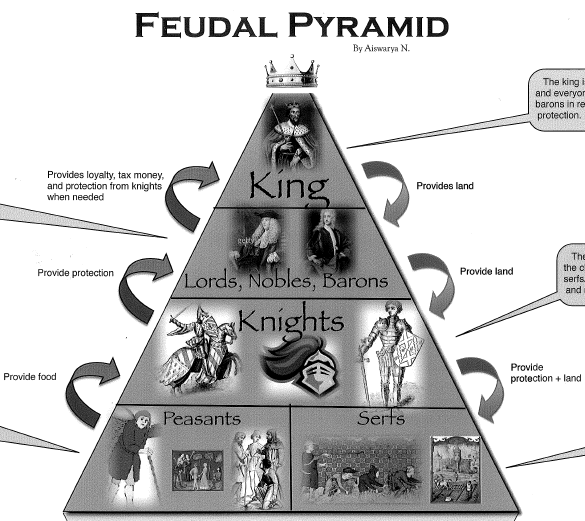 This is a picture of the Feudal Class System. 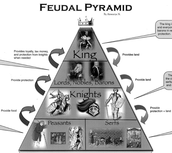 As you can see from the photo Kings were at the top then under them were Nobles followed by knights, and finally by Peasants and Serf at the bottom. Although the King in this type of system was somewhat like a tyrant who made all the decisions it was a lot of give and take. For example, nobles got land in exchange for serving on the Royal Council. While the Peasants got a place to live if they farm. The system is full of lots of compromise. 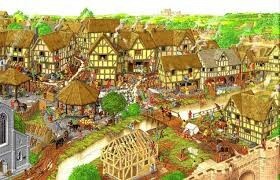 This is a picture of what a medieval town and manor might look like. I can not choose if it was good or bad because I think how they work together is good, but the King tyrant power could get out of control. It’s good because they all work together. For example, the upper class (barons, lords, and nobles) got land from the king if they provided them with knights. Then the knights got land, but in exchange gave the barons protection and worked military for the king when needed. The peasants/serfs got land because they would give labor and farm for everyone! However, I do not think the way people were treated and their rights were fair. The king had all power and the barons were respected and had more rights and power than knights and were very wealthy. The knights had more rights, land power, and wealth than peasants and were treated with respect. Peasant were given no respect and had very little rights or power. 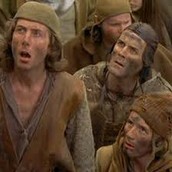 Finally, the serfs had no rights, no respect, and power Serfs were slaves. I disagree with how people were treated because there were no equal rights. The Feudalism was full of cooperation and conflict because of how it was set up. For example when somebody has too much power it could be conflict because some people don’t agree with his rules. 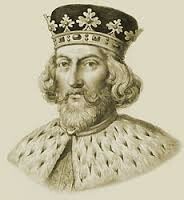 However, as the Feudal System continued the peasants, nobles, and others under the king had him sign a Magna Carta, which limited the King’s powers and gave more rights to those under them. 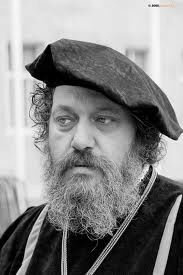 A school is like feudalism because the principles have all power, make the rules and choices like a king would. While, the teacher has power like a noble where they can make his/her own class rules but still has to follow the principles rules as well. Students do not have power, but they have rights However they do not make rules. The students are similar to that of a peasant. Our government is not like feudalism. The US government is a republic democracy, which is like an indirect democracy. I do not think citizens of the US could handle having one person with so much power. Its different than Rome and Greece who both had a form of democracy where only men could vote. However, Rome and Greece societies were similar as in they had different classes who held different powers. 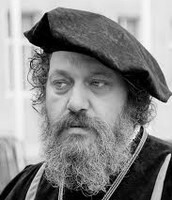 For example, Greece had wealthy people like nobles in higher up positions and people who were considered free sort of like peasants with less structure. Also Greece had Sparta and Rome had gladiators, which were similar to Knights in the fact that they fought.